The science fiction thriller Outland has some very exciting special effects that could stand up to today's in comparison. Now on Blu-ray for the first time, the special formatting, HD process and slick transfer to the new format makes the film even better on this second home video go around. If you like outer space fantasy and if you have never seen the film on DVD, then here's a chance to enjoy it in all its original glory. Police Marshall O'Neil gets reassigned to take over as head enforcer on a mining outpost at one of the small moons of Jupiter. Upon arriving at the space colony he gets introduced to the town's boss Sheppard (Peter Boyle), a tough leader who feels O'Neil is more of a nuisance than help. Getting a cold welcome from the miner's headman, O'Neil responds with a few sly remarks of his own putting him at odds. Strange deaths to several miners start occurring and O'Neil has suspicions that it's due to a virus of some kind. Working with Dr. Lazarus (Frances Sternhagan) the two find evidence that a drug ring has been working its way through the populace of the colony and there's evidence that the bad dope they are serving has been causing widespread psychological damage. Alarmed, O'Neil starts to investigate, but when the ringleaders start to retaliate, things get out of control. The incredible sets, use of green screen and special effects are brilliant for this 1980's era of filmmaking. Although fantasy effects using computer graphics today do outweigh the ones used in Outland, the production here still shines brighter than other science fiction films during the same period. Very credible filmmaking, the exploding of the bodies due to 0 gravity are cringing, the weightless space walks convincing and the multi-level space station a realistic possibility. Director Peter Hyams (Running Scared, Time Cop) pulls off an exciting film on the set giving a claustrophobic touch to the interior chase while providing a vast view of space during the action outside the mining village's space station. The acting takes over the film's focus with Sean Connery putting on a great show as a adamant police marshal who won't back down. He's James Bond and John Patrick Mason (The Rock) all rolled into one. When he speaks, the dialog flows like only he can project. In support, James Sikking plays Sergeant Montone, O'Neil's only support on the huge colony. He's quick to come to O'Neil's aid, but not fast enough to do him enough good. The Blu-ray has an interesting and revealing Commentary by director Peter Hyams. After you have watched the film or for fun if you have already seen the film in the movie theater, turn it on and listen to Peter. In an appealing way he gives many details including some of the reason why each cast member was chosen, Peter Boyle's fine delivery of his character in spite of not having a clue about the fantasy of the storyline, how the sets were developed and much more. It's like have a ‘making of' during the showing of the movie. Download Outland from the iTunes Store in Digial HD. 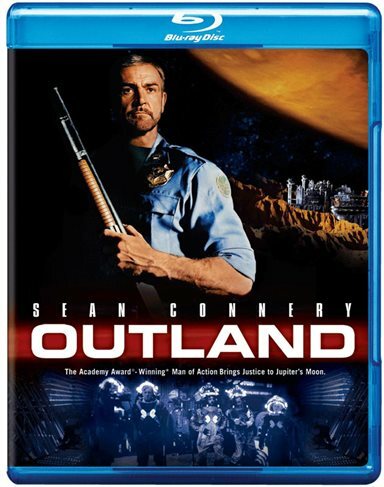 For more information about Outland visit the FlickDirect Movie Database.